Features: Method in the madness? 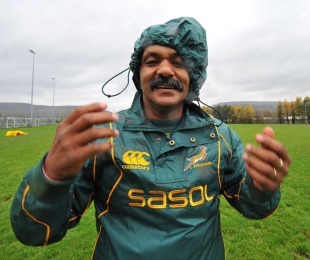 The controversial, sometimes bizarre but perpetually entertaining Peter de Villiers appears to have called time on his stint as coach of South Africa but as ever with the Boks boss you are never quite sure what he is on about. Over his near four-year tenure, the outspoken De Villiers has overseen moments of triumph and adversity and to celebrate his exit, this week's Scrum Sevens looks back at some seminal moments form his time in the Boks' hotseat. De Villiers was unveiled as the first ever non-white coach to take charge of the Springboks in the wake of their 2007 Rugby World Cup triumph and following Jake White's surprising exit. His appointment came from left-field as he had never coached at Super Rugby level and could only boast experience of coaching the U21 side although he did also steer the Emerging Springboks to IRB Nations Cup glory in 2007. Following in the footsteps of White was no easy task, but De Villiers immediately laid out his intentions for his tenure saying: "Players must understand they will all stand an equal chance. If they are good enough, talented enough and work hard enough they will be part of the squad." However, behind his appointment there were clear attempts by the SARU to promote racial equality - a fact alluded to by president Oregon Hoskins at his unveiling who said: "I want to be honest with South Africa and say the appointment did not take into account only rugby reasons. We took into account the issue of transformation in rugby very, very seriously when we took the decision." The British & Irish Lions travelled to South Africa full of optimism looking to record their first Test series win since 1997 but in their way lay a determined Sprinboks side. After overcoming the Lions in the first Test of the three match series, De Villiers started Schalk Burger in the second game with the flanker earning his 50th cap for the Springboks in the process. In the opening exchanges of the match, Burger made contact with Luke Fitzgerald's eye and despite assistant referee Bryce Lawrence's confirmation of an apparent gouge, Burger was only given a yellow card. The incident provoked outrage and De Villiers' post-match comments only served to stoke the fires as he gave his backing to Burger and stated that "rugby is a contact sport." His provocative comments led to an apology from the man who unveiled De Villiers 18 months prior with Hoskins saying: "We would like to apologise to the rugby community for the erroneous impression that acts of foul play are in any way condoned by South African rugby. That has never been the case and is not now, and we support strong action by rugby authorities when such acts occur." After the SARU had released their statement on de Villiers' post-match comments concerning Burger - the Boks coach spoke of his regret saying: "A lot was said this week, I think too much. The off-the-field stuff sometimes gives you more sleepless nights than the on-field stuff. "We had negative media from Britain in 1974 and 1980 and now I've allowed it again in 2009. What a stupid bugger I am! I've learnt that if they can't win on the field then they will try to win anywhere else they can." Another incident dogging the Springboks during the 2009 tour was 'hand-shake gate.' Lions head coach Sir Ian McGeechan rejected de Villiers' comments that he refused to shake the Boks coach's hand after the second Test leading de Villiers to come out with the phrase: "I won't change my style. If I change my style I change Peter de Villiers and I'll (have to) go back to God and say you did a bad job. And I can't do that. That would be bad of me as a person. I'll just be the best I can be." The Boks went into the 2009 Tri-Nations full of hope on the back of their impressive series victory over the Lions but standing between them and the southern hemisphere crown were the number one side in the world - the All Blacks. But they rose to the challenge and just one defeat in six games saw the Tri-Nations silverware return to South Africa for only third time. And they wrapped up the title in impressive fashion. Facing the All Blacks in Hamilton, the Boks overcame the Kiwis 32-29 with tries from Fourie Du Preez and Jean de Villiers along with the kicking exploits of Morne Steyn and namesake Francois. This was probably the crowning moment in De Villiers' reign. After criticising Hamilton as a "boring" place, he was later asked whether he found anything to do during his stay in the New Zealand city. "Ja you know, we did find something to do," he replied. "We won the Tri-Nations in Hamilton." The Springboks opened their 2010 Tri-Nations campaign with back-to-back Test defeats to the All Blacks. South Africa had players sin-binned in both games with Bakkies Botha and Danie Rossouw both falling foul of the referees' yellow card. Despite having been beaten comprehensively 32-12 and 31-17, De Villiers aligned his side's poor disciplinary record to a global conspiracy aimed at ensuring the Kiwis were in the richest of health ahead of the 2011 World Cup. "I've got my own observations about the last two Tests, and maybe I can't say it in public, but we do have a World Cup in New Zealand next year and maybe it was the right thing for them to win the games so they can attract more people to the games next year," he said. An IRB misconduct charge was levied at the coach and a vote of confidence from the SARU followed their defeat to the Wallabies a week later. At the start of the 2011 Tri-Nations, De Villiers controversially left 21 players at home due to 'injury' as a second-string squad headed overseas for clashes against Australia and New Zealand. Predictably, two very one-sided games followed and De Villiers' selection policy came under fire from previous Boks coach Jake White. Amid accusations that the 21 'injured' players were in fact at a secret training camp in Rustenburg, De Villiers was forced to defend their omission exclaiming that "there's mischief every week." With the matter still on the media's agenda, SARU chief executive Jurie Roux stepped in and said: "I am not denying they are in Rustenburg, I am denying there is a secret training camp. I have got my players in a single high-performance entity being rehabilitated. That is it, but you [New Zealand media] want me to say I'm running a separate Springbok team and have sent a B team here. "Well, I would like to cut the cast off Schalk Burger's finger, I would like Andries Bekker to not need an operation, I would like all of them to be uninjured, but they are injured and being rehabilitated, so what do you want me to do? I am not a miracle worker." October 2011 - End of an Era? In the aftermath of South Africa's recent World Cup quarter-final loss to Australia, a defeat that saw the Springboks claim 80% of the territory, De Villiers appeared to signal the end of his career as Springboks coach in the post-match press conference saying: "There is a time to come and a time to go and the journey I think for me is over." However, nothing is ever quite as it seems when it comes to PDivvy and days later he amended his original statement emphasising that he was not resigning his post as Boks coach and would wait until the end of his contract [in December 2011] before confirming where his future lies. "No, I never resigned, I was just saying it was the end of the road. It's logical," he said. "I have a four-year contract and I've known all along that this day would come. I will live and die by that contract, which ends in December and then I won't have a job." With the SARU undertaking a review of South Africa's World Cup, the future looks bleak for De Villiers. Whether he stays or goes, the Boks coach has provided the rugby watching public with a huge amount of enjoyment throughout his tenure and it's only fair that the last word goes to him.